How was Valentine’s Day? We had a fairly normal day. I got FOOD for Valentine’s. It was great. Coffee ice cream, chocolates, organic vanilla yogurt and a smoothie. Pretty close to heavenly I’d say. I provided hubby with breakfast in bed – brown sugar french toast and coffee. We had some friends over deseert that evening and enjoyed a German apple cake/pie thing, cupcakes, and mousse. Each couple brought a dessert. I made the mousse. Did I mention it was in chocolate or peanut butter cups, also made by me? Soooo good. My hubby doesn’t eat a whole lot of baked goodness, but that is one dessert he’ll eat. Sorry to say I didn’t get any photos of those desserts, but I’m sure I’ll get around to doing it another day. Did I mention that this is our …. 7th Valentine’s day together? (I think… I’m starting to lose count…) But only our second married. It’s been great. It’s still winter! But it has been wonderfully warm and sunny out the past 2 days, it almost feels like spring! And spring IS coming, which is amazing. I cannot believe how fast this year is going! Me and the baby went for a walk yesterday with another mom and baby and had a blast. It was a great almost 2 hour walk. The awesome thing about walking with someone else is you don’t even notice how long you’ve been walking because you are so preoccupied with what women do best… Talking! So encouraging to talk to other ladies, especially when you can relate to them and share a faith with them. Anyways! February had two busy weeks in it for me and mine. And it includes a lot of cake-eating and baking. 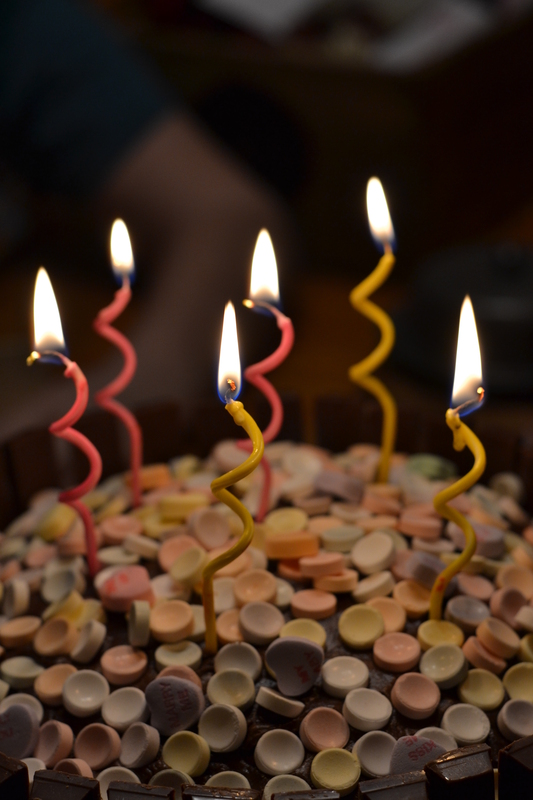 My mother’s, aunt’s and husband’s birthdays. Plus, Valentine’s Day. 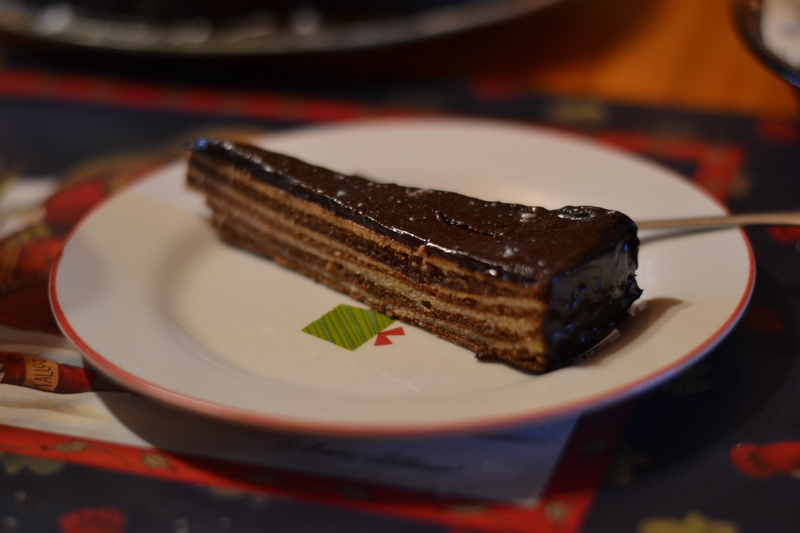 AND, we had company over last week one day for lunch, and made a cake-type thing for dessert that day as well. I am a fan of cakes. But truly, it’s not the cake that I look forward to eating the most. It’s most certainly the icing. I. LOVE. Icing. When I slice my cake, I make sure to scrape that little bit of icing that stays on the platter off of that platter and onto my plate. My mother on the other hand, will scrape any of what she calls, ‘excess’ (I NEVER have had ANY excess icing!) icing and I normally will inform her that she’s wasting and proceed in transferring it from her plate to my cake. Did I mention that I love icing?? 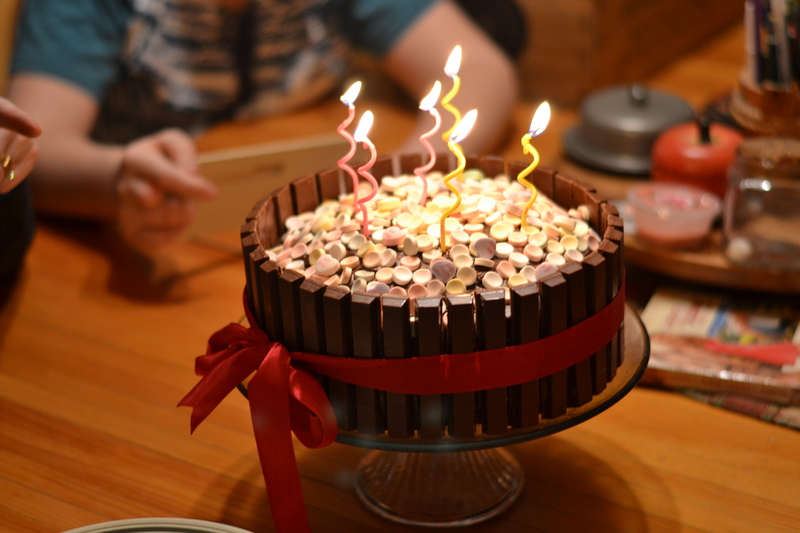 Mom got a very, very chocolate cake on her birthday. I was on Pinterest, and discovered some pictures of this cake. 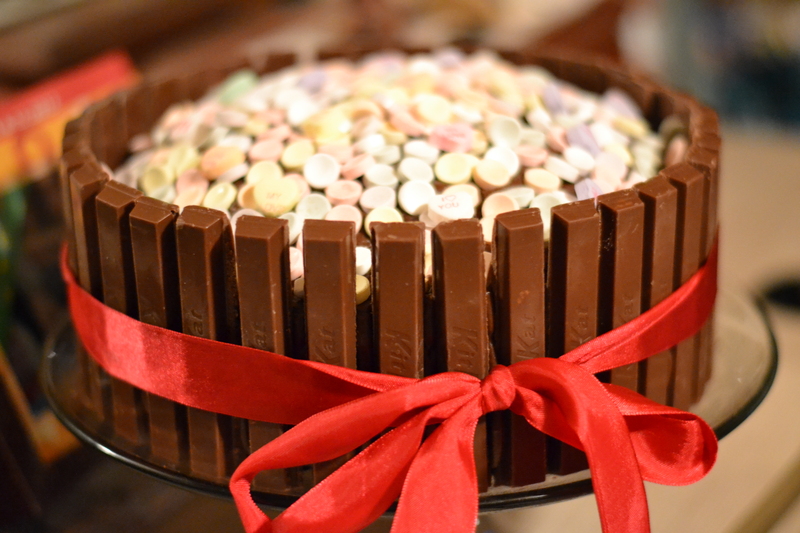 You use a chocolate cake, frost it, and then stick KitKat bars the whole way around. Mom’s favourite chocolate bar just so happens to be the KitKat bar. Therefore, I knew I just had to make this cake. Preheat oven to 375. Blend together the oil and sugar. Add eggs, salt and vanilla. Stir in cocoa and hot water. Mix in 1 cup flour and baking soda. Stir in 1 cup milk. Add remaining flour, mix. Stir in remaining milk. Batter will be runny and oh, so chocolaty. Make sure to lick the bowl out when you’re done. 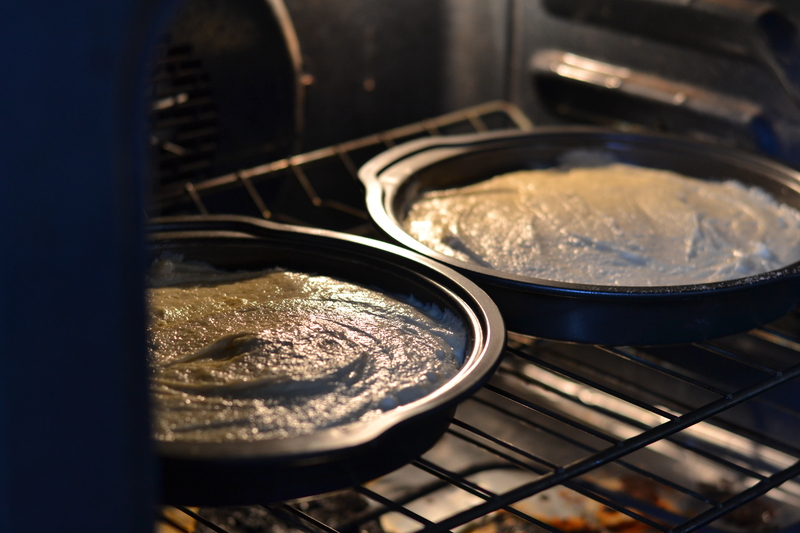 Pour into 2 9′ round pans (that have been greased and floured), or a 13×9 baking dish. Bake for 45 minutes, or until middle is set. Cool for 15 minutes on a wire rack. Take cakes out of pans. Cool completely before frosting (or you will have a mess!). 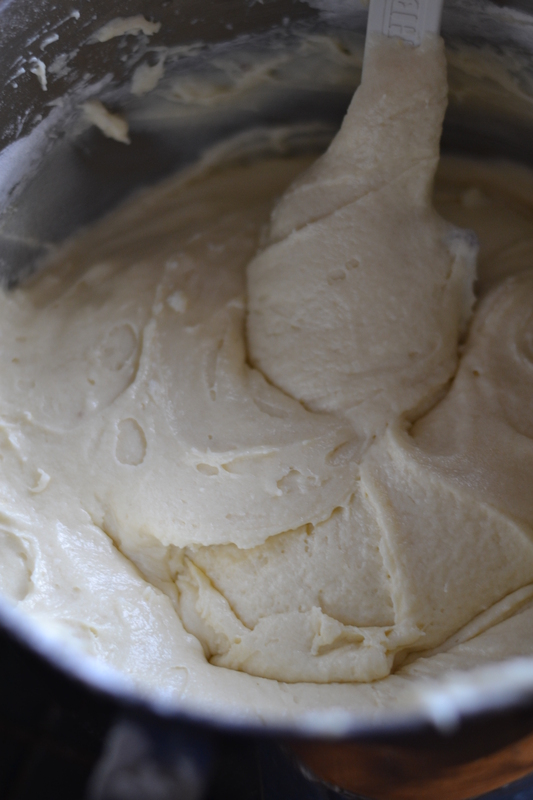 Today, I’m starting a cake for a birthday celebration for my mother and aunt tomorrow. This will be completely different from Mom’s previous cake. Notice the light colour (not chocolate at all). It won’t have chocolate frosting either. This finished cake will be posted this weekend – I’m not quite sure how it will look yet, but keep checking for those pictures! If you are more a fan of coffee cakes, (ie – no icing, less sweet…) check out this Blueberry Cake recipe. How was your Valentine’s Day? How did you celebrate? Who did you celebrate with?